1. You’ve to defined two properties for SortExpression and SortDirection. 2. Set these properties values in gridview sorting event. 3. 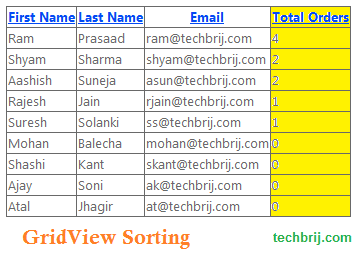 Get and Bind the Ordered data to gridview. Hope, It saves your time. Share your opinion or suggestion about it. I follow your post then sorting successfully, but couldn’t paging with this. How can I paging with this anonymous type?